MICHAEL ARUMAINAYAGAM is in 11th grade and attends Wellesley High School. He started playing cello when he was 8 years old. He studies with Eugene Kim at New England Conservatory Prep and previously with Susanne Friedrich. He is a member of the NEC Youth Philharmonic Orchestra, the Wellesley High School Honors Chamber Orchestra, and the Morse Quartet. 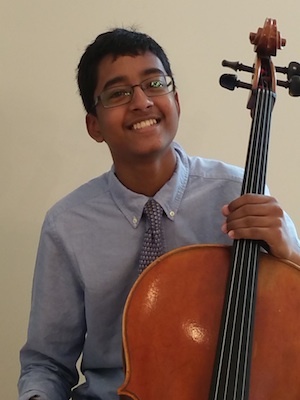 He has served as principal cellist of the Massachusetts All State Orchestra (2016), the Eastern Senior District Orchestra (2016) and the NEC Youth Symphony (2015). Michael was also a member of From the Top’s 2015-2016 class. Outside of music Michael loves to travel and explore different cultures. He has visited South Korea, China, India, Sri Lanka, Greece, Italy and Ireland. He has a third-degree black belt in Taekwondo and is a member of the Jae H. Kim Taekwondo international demonstration team. Michael is a member of the Center for Development of Arts Leaders (CDAL) in Boston.